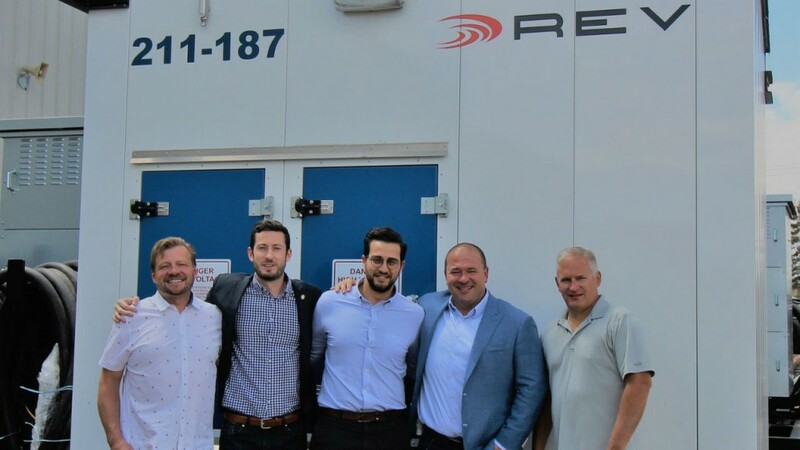 From left to right: Roland Davidson, Principal, REV; Gaetan Djenane, Business Development Manager, Schneider Electric; Kareem Nakhla, Offer Marketing Specialist, Schneider Electric; Daryll Lowry, Sales Manager, REV; Shawn Oldenburger, Principal, REV. REV offers flexible, durable, reliable and responsible electrical designs, products and services for oil and gas, mining, commercial and utility industries. Through its unique approach to its people, products and projects, REV empowers clients through safety, quality, teamwork and trust. "Schneider Electric and REV have worked together for years and as the market evolves towards safer, more reliable and flexible solutions it seemed natural for us to join forces to better serve the local industry," said Christian Cossette, Marketing and Engineering Director, Canada, Schneider Electric. "This partnership will allow our customers to benefit from Schneider Electric's world class arc resistance equipment integrated into custom solutions, designed and manufactured in Alberta. We are thrilled to be closer to end customers in Western Canada." The principals at REV are excited to partner with Schneider Electric on its medium voltage line of arc resistance equipment. This partnership allows REV to bring to the Western Canadian market full lifecycle support of these products. "This was an easy agreement as both companies share a similar set of corporate values that are rooted in supplying and supporting the highest quality reliable products that are manufactured and delivered on time and safely," said Shawn Oldenburger, Principal, REV. Effective immediately, REV and Schneider Electric's partnership is ready to deliver tailor-made solutions adapted to meet local needs.